Achla created this Jardin or garden design, inspired by traditional Turkish rugs. They feature medallions of tulips and carnations, and borders of stylized carnations. They are available in rich Vermilion, Cocoa, and Noir, an elegant combination of black and beige.Hearth rugs protect your floor and will add beauty and warmth to your fireplace. 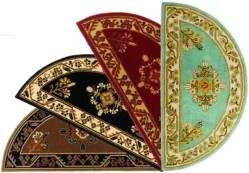 They can also be used as door mats or as occasional rugs throughout your house. (For indoor use only).All our hearth rugs are woven from the highest quality 100% virgin wool and dyed in rich saturated colors. They are fire resistant and meet federal requirements for surface flammability of small carpets (Part 1631 - FF2-70).Warning: your pets will probably make a bee-line for these rugs so they can bask in the warmth of the fire! Achla created this Jardin or garden design, inspired by traditional Turkish rugs.